A superb ganja sativa grown by the Hmong people of Lao producing a very high quality finished product. 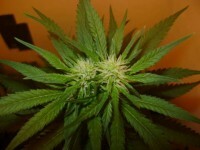 Buds have large calyxes and a sweet and tangy taste with slight sandlewood undertones. 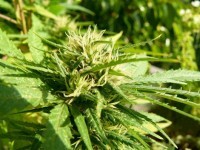 The high is very intense but not unpleasantly pushy or racey as some Southeast Asian sativas can be. It cures to a light green colour. As well as having excellent mold resistance it is a great breeding parent. Indoors this requires skill: it can be vegged on 14 hours light. Flowering is more profuse on 11 hours light. This is a late maturing strain that will require a greenhouse at northern latitudes.